The common kitchen sink. Doesn't seem like much of an anomaly from this perspective. The kitchen sink has eluded philosophers, advertisers, scientists, managers, and several important deities for centuries. The precise nature of the sink is ever-changing and continues to dodge any amount of numbers, statistics, cleverly worded quotations, cheeky observations, and natural laws that anyone may wish to throw at it. Exactly why the sink is such an impossibility remains a mystery. Yet it is interesting to highlight one time in recent history when sinks became a cultural icon and gained the popularity we now know them to have today. The precise reason why humankind cannot grasp the complexity of the Universe lies in what scientists have labeled the "Lack of Sink". This lack was famously discovered upon attempting to create a theory explaining the existence of everything. Through months of research, work, lots of paper, long nights in laboratories and long times in lavatories, and enough money to buy out Microsoft, the mysteries of the world were unraveled before the scientists' minds. For those without comedic tastes, the self-proclaimed experts at Wikipedia have an article about Kitchen sink. To start off, all that stuff about atoms had to go. Gravity, they discovered, was little more than imagination. Philosophy couldn't touch this brand new theory with a long beard, and it explained everything so clearly that even religious groups weren't in an uproar about it. It was perfection itself. Finally, just as they were about to finish off the universal mysteries for all eternity, a fellow scientist pointed out one fatal flaw in the whole diagram: There was, in fact, no explanation for the common kitchen sink. "At first I just dismissed him," explained one scientist on the team. "But then I thought about it. No matter how hard we tried, we couldn't get the kitchen sink to fit into our theory. It was like trying to get a square peg into a round hole, except more complicated, across several different dimensions and involving higher math. I kept thinking, this is impossible, I'm just tired. We even got to explain the presence of Bush and the reason why celebrities haven't been killed off yet. But we hit a stumbling block, and fell." 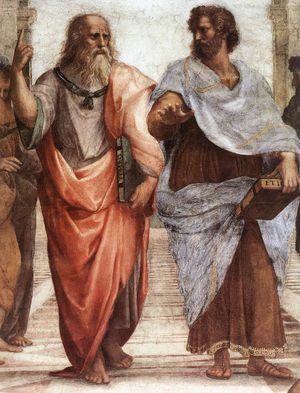 One must have the looks if one is to philosophize properly. Science, sitting in a corner looking over lab notes and scratching its head importantly with a number two pencil, was soon overtaken by religion. The Pope explained the whole fiasco by saying the Universe wasn't meant to be understood, but most people considered this little more than an excuse. Philosophy stepped in briefly, calling the final missing element in human understanding the Kitchen Sink. "You can have everything," said one philosopher with a false beard, "but the kitchen sink." On a side note, Oscar Wilde once stated the he "enjoys writing his masterpieces in the vicinity of a kitchen sink". Immediately, people began calling up their local philosophers and interrupting their meditation sessions, claiming that they owned a kitchen sink. The philosophers simply said that there was no proof of ownership and rapidly dismissed these absurd accusations. People, being as greedy as they are, made several attempts to include the kitchen sink in everything they did. Cyclists tied kitchen sinks to their bikes as they rode along; dollar stores included various kitchen sinks in their merchandise; posters of sinks and pictures of people taking their sinks to work with them became commonplace. The common phrase during this period was, "It's 07:04, do you know where your sink is?" Most people did, and kept logs and blogs about it. 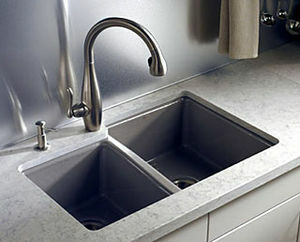 Reportedly, two MySpaces devoted entirely to sinks were created. Someplace on cable, a documentary on the history of the kitchen sink was done that no one bothered to record. Equal rights groups were created, and a liberal movement was started to get kitchen sinks the freedom of being included in living rooms everywhere. Movie rights with sinks as main plot devices were sold and became instant bombs. 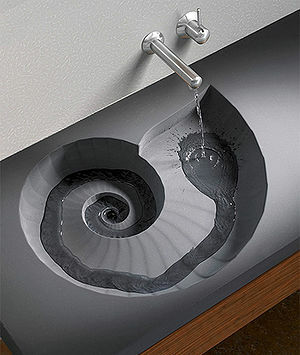 Slowly, the sink became a part of everyday life. But it still didn't feel right. People taking their sinks on "Take Your Sink To Work Day" still felt silly about the whole thing. Sinks made very boring pets and didn't go for walkies. Trying to include a sink in conversation was very awkward for all involved, even more so during a formal dinner. With great reluctance and sadness, the masses discovered that the kitchen sink was simply not something one could include with the rest of the Universe. It clashed. It lagged. Oftentimes it just sat there. The Universe moved on while kitchen sinks did little more than drip and collect food in their drains. It was concluded that the kitchen sink was little more than a universal abnormality, and that mankind can never truly have everything and the kitchen sink. People mourned the failure of science, philosophy, religion, various gods, mathematics, and the population of Earth in general, then went back to their daily lives, never thinking about sinks unless they were doing dishes or on a punctured boat. Everything finally went back to normal. Well, everything but the kitchen sink.